An animal control officer sprung into action when he found a dog lying unresponsive on the sidewalk. He first tried to call to the dog, but there was no response. He slowly approached and noticed the dog was still breathing, but not responding to his touch. Then he learned the horrifying truth about what happened to the sweet dog named Peanut. Neighborhood kids allegedly injected Peanut with cocaine. The drug caused her heart to race and left her clinging to life. The officer picked her up and noticed she was panting heavily. He rushed her to Faithful Friends Animal Society. Peanut was finally surrounded by loving people who would do everything they could to save her. Without knowing exactly how much drugs she had in her system and her declining state, her survival was uncertain. The staff put Peanut on an IV to start flushing out the dangerous drug. 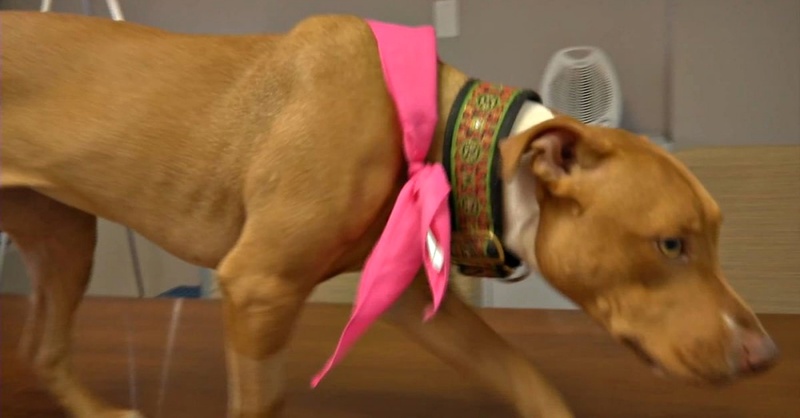 Due to the deadly dose, Peanut was not able to walk, stand, eat, or drink when she arrived. All she could do was lay panting with her heart racing. After a few days on the IV, she started to improve a bit. A toxicology report was run and the results were shocking. Peanut tested positive for cocaine and tetrahydrocannabinol (THC). The poor dog was suffering because kids forced her to consume drugs. The drugs needed to be flushed quickly out of her system before they killed her. The IV was her only hope at pulling through. The staff gave her fluids for two days along with much needed emotional support. They showed Peanut that not all humans are cruel. They thought Peanut was about a year old. This young pup had already endured extreme torture instead of running and playing. Luckily, because of her young age, her body was more resilient and able to survive the intense torture. Surprisingly, Peanut returned to her happy self and was friendly with the staff. Even after all she had been through she was a sweet dog just looking for love. The staff fell in love with her and wanted her to find a loving home. Although she was starting to improve, she had a long road of recovery ahead. With persistent care, Peanut made a full recovery. They discovered that she loves to play with a ball. “She wouldn’t let her ball out of her sight,” Rentz said. When her story made the news, a family in Delaware contacted the center and asked if they could adopt her. They came to the center to meet her and fell in love. Peanut finally found a loving home.